Covent Garden is a district in London on the eastern fringes of the West End, between St. Martin's Lane and Drury Lane. It is associated with the former fruit-and-vegetable market in the central square, now a popular shopping and tourist site, and with the Royal Opera House, which is also known as "Covent Garden". The district is divided by the main thoroughfare of Long Acre, north of which is given over to independent shops centred on Neal's Yard and Seven Dials, while the south contains the central square with its street performers and most of the elegant buildings, theatres and entertainment facilities, including the Theatre Royal, Drury Lane and the London Transport Museum. The area was briefly settled in the 7th century when it became the heart of the Anglo-Saxon trading town of Lundenwic, abandoned at the end of the 9th century. By 1200 part of it had been walled off by Westminster Abbey for use as arable land and orchards. Referred to as "the garden of the Abbey and Convent", and later "the Covent Garden", it was seized by Henry VIII and granted to the Earls of Bedford in 1552. The 4th Earl commissioned Inigo Jones to build some fine houses to attract wealthy tenants. Jones designed the Italianate arcaded square along with the church of St Paul's. The design of the square was new to London and had a significant influence on modern town planning, acting as the prototype for new estates as London grew. By 1654 a small open-air fruit-and-vegetable market had developed on the south side of the fashionable square. Gradually, both the market and the surrounding area fell into disrepute, as taverns, theatres, coffee-houses and brothels opened up. By the 18th century it had become a well-known red-light district. An Act of Parliament was drawn up to control the area, and Charles Fowler's neo-classical building was erected in 1830 to cover and help organise the market. The market grew and further buildings were added: the Floral Hall, Charter Market, and in 1904 the Jubilee Market. By the end of the 1960s traffic congestion was causing problems, and in 1974 the market relocated to the New Covent Garden Market about three miles (5 km) south-west at Nine Elms. The central building re-opened as a shopping centre in 1980, and is now a tourist location containing cafes, pubs, small shops, and a craft market called the Apple Market, along with another market held in the Jubilee Hall. Historically, the Bedford Estate defined the boundary of Covent Garden, with Drury Lane to the east, the Strand to the south, St. Martin's Lane to the west, and Long Acre to the north. However, over time the area regarded as part of Covent Garden has expanded northwards past Long Acre to High Holborn, and since 1971, with the creation of the Covent Garden Conservation Area which incorporated part of the area between St. Martin's Lane and Charing Cross Road, Charing Cross Road has sometimes been taken as its western boundary. Long Acre is the main thoroughfare, running north-east from St Martin's Lane to Drury Lane. Shelton Street, running parallel to the north of Long Acre, marks the London borough boundary between Camden and Westminster. The area to the south of Long Acre contains the Royal Opera House, the market and central square, and most of the elegant buildings, theatres and entertainment facilities, including the Theatre Royal, Drury Lane, and the London Transport Museum; while the area to the north of Long Acre is largely given over to independent retail units centred on Neal Street, Neal's Yard and Seven Dials; though this area also contains residential buildings such as Odhams Walk, built in 1981 on the site of the Odhams print works, and is home to 7,000 residents. 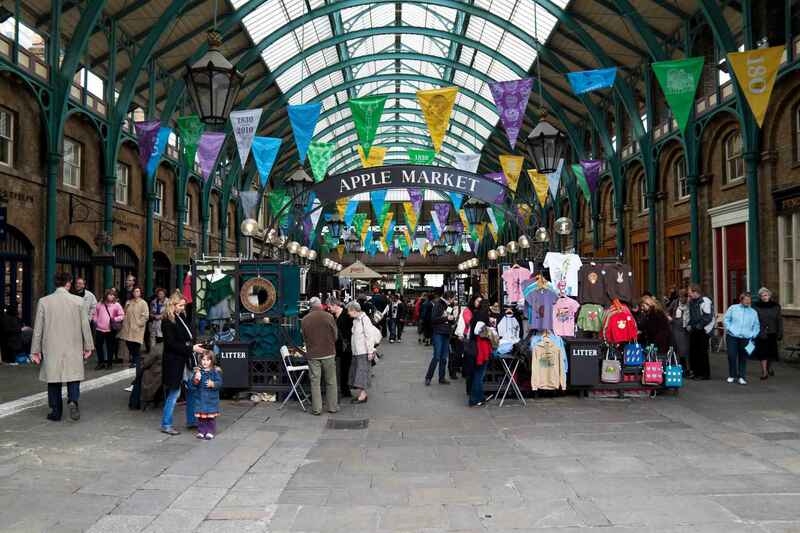 The Covent Garden area has long been associated with both entertainment and shopping. Covent Garden has 13 theatres, and over 60 pubs and bars, with most south of Long Acre, around the main shopping area of the old market. The Seven Dials area in the north of Covent Garden was home to the punk rock club The Roxy in 1977, and the area remains focused on young people with its trendy mid-market retail outlets. Street entertainment at Covent Garden was noted in Samuel Pepys's diary in May 1662, when he recorded the first mention of a Punch and Judy show in Britain. Impromptu performances of song and swimming were given by local celebrity William Cussans in the eighteenth century. Covent Garden is licensed for street entertainment, and performers audition for timetabled slots in a number of venues around the market, including the North Hall, West Piazza, and South Hall Courtyard. The courtyard space is dedicated to classical music only. There are street performances at Covent Garden Market every day of the year, except Christmas Day. Shows run throughout the day and are about 30 minutes in length. There are a wide range of restaurants, mainly in Covent Garden's central area around the piazza, and in the St Martin's Lane area bordering the West End; some of these with international reputations. Among the restaurants are the historic theatrical eating places, the oldest of which is Rules, which was founded in 1798, making it the oldest restaurant in London, followed by J. Sheekey, an oyster bar and fish restaurant founded in 1893 by market-stall holder Josef Sheekey in Lord Salisbury's St Martin's Court, and The Ivy, which was founded as an unlicensed Italian cafe by Abel Giandellini in 1917. Other restaurants include Belgo Centraal on Earlham Street, part of the Belgo chain of Belgian themed restaurants; one of Jamie Oliver's Italian restaurants, which opened in 2007;Gaby's Deli, a Jewish cafe and restaurant serving falafels and salt beef sandwiches since 1965, and Mon Plaisir, founded in 1943, one of the oldest French restaurants in London. Covent Garden was home to some of London's earliest coffee shops, such as Old Slaughter's Coffee House, which ran from 1692 until 1843, and a Beefsteak Club, the Sublime Society of Beef Steaks, which was co-founded in 1736 by William Hogarth at the Theatre Royal (now the Royal Opera House). Covent Garden is served by the Piccadilly line at Covent Garden tube station on the corner of Long Acre and James Street. The station was designed by Leslie Green and opened by Great Northern, Piccadilly and Brompton Railway on 11 April 1907, four months after services on the rest of the line began operating on 15 December 1906. The station is one of the few stations in Central London for which platform access is only by lift or stairs. Until improvements in 2007, due to high passenger numbers (16 million annually), entry to the station was sometimes restricted on busy days to reduce congestion on the platforms. The distance from Covent Garden to Leicester Square at less than 300 yards is London's shortest tube journey. 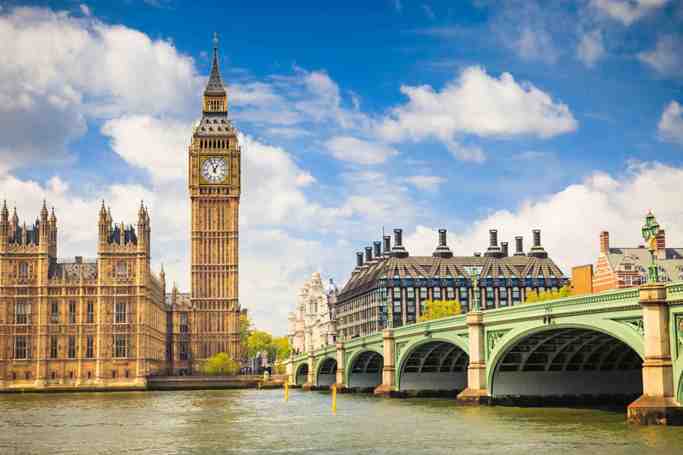 Stations just outside the area include the Charing Cross tube station and Charing Cross railway station, Embankment tube station, Leicester Square tube station, and Holborn tube station. While there is only one bus route in Covent Garden itself—the RV1, which uses Catherine Street as a terminus, just to the east of Covent Garden square—there are over 30 routes which pass close by, mostly on the Strand or Kingsway. 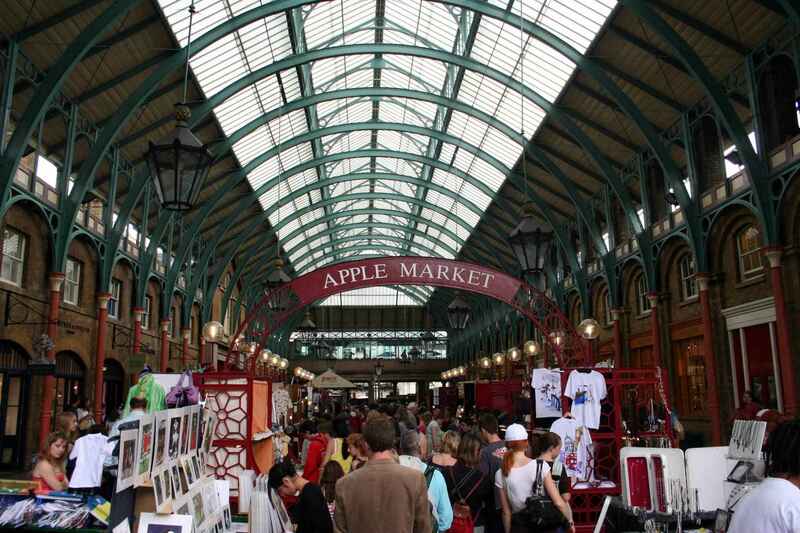 Covent Garden | eTips Inc.